Over the weekend Rudy had a few friends over for a potluck hi-tea of sorts, and given that it was Sunday afternoon I wanted to make something really simple and quick. Mac and cheese came to mind, and up until then I never could find any recipe that I would make again. This one was actually decent, without having to spend a ton on exotic cheeses or do anything particularly difficult, and was well received. I added some additional ingredients to jazz it up a little, but this one is definitely a keeper. Based on the recipe by The Food Lab. Place the macaroni in a large saucepan and cover it with water by about 2 inches. Add 1 tablespoon of salt, then bring to a boil over high heat, stirring occasionally to keep the pasta from sticking. Cover the pan, remove from the heat, and let stand until the pasta is barely al dente, about 8 minutes. Drain and set aside. 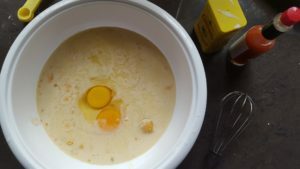 Meanwhile, whisk together the evaporated milk, eggs, hot sauce, and mustard powder in a bowl until well incorporated. 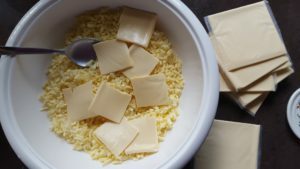 Toss the cheeses with the cornstarch in a large bowl until thoroughly combined. 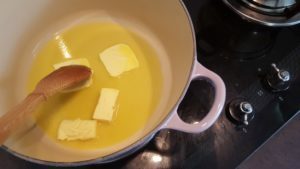 In a large saucepan over low heat, add the butter, and stir until melted. Add the milk mixture and cheese mixture and cook, stirring constantly, until the cheese is completely melted and the mixture is hot and creamy. Season to taste with salt and more hot sauce. Add the macaroni, beef bacon bits and sliced green onions if using, and stir to combine. Serve immediately, topping with additional sliced green onions if desired.